Join us for an exploration of vernal pools and the many amphibians born there every spring. Dave Havens, environmental science teacher at St. Luke’s School and Vice President of NRWA will begin with a short introduction on amphibians and how to spot them, then lead a woodland walk along the Norwalk River Valley Trail in Wilton to visit vernal ponds coming to life with salamanders, newts, frogs and toads. Discover some of the many species in our area, search for eggs and tadpoles, and learn about amphibian development. Meet at the cul-de-sac at the end of Twin Oaks Lane in Wilton. Tall, waterproof boots are suggested. 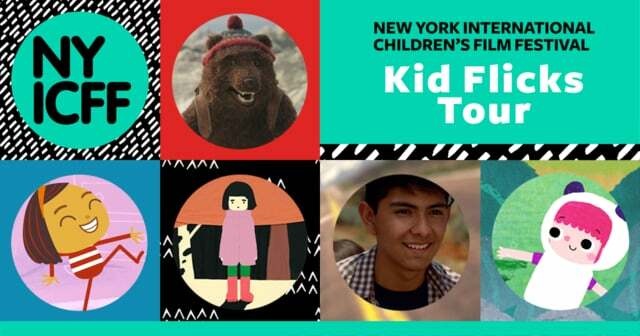 All ages are welcome to this free event. Register for this free event by emailing us at info@norwalkriver.org. Rain date: Sunday, April 28. Space is limited. 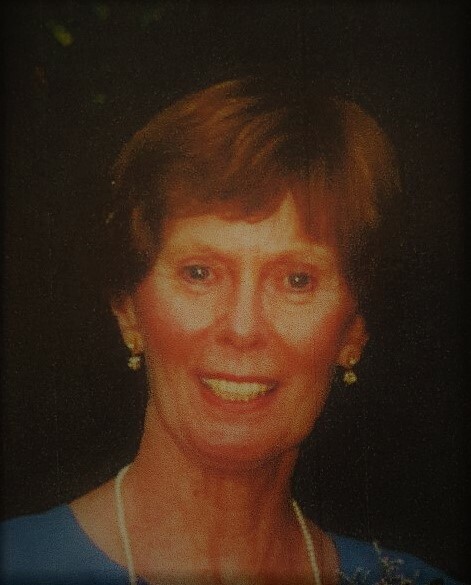 Ruth Wardrop Lyons, 85, of Ridgefield, CT, passed away peacefully at home on April 10, 2019, following a brief illness. She was born April 29, 1933 in Bridgeport, CT to Thomas and Mary (Blackburn) Wardrop. Her’s was a journey walked with grace and humility, humor and love. Childhood circumstances found her beloved older brothers, Thomas and Robert, in charge of her upbringing during her formative years. The importance of family and faith was at the heart of their care. They shaped her into the mannered and open-hearted soul that she would become. She had a way of making people feel uniquely familiar. Ruth attended boarding school at Wykeham Rise, Washington, CT. and graduated from Bassick High School, Bridgeport, CT. She attended the University of Connecticut and the Katharine Gibbs School. On June 25, 1955 she was married to Raymond H. Lyons in a ceremony performed by her brother, the Rev. Robert Wardrop, at Trinity Episcopal Church, Hartford, CT. Hitching her star to a traveling salesman, her early years of motherhood included setting up nurseries from Hartford to Philadelphia to Rochester. In 1967 the family of five settled in Fairfield County, CT. As her children Elizabeth, Paul and Sarah progressed through the Wilton, CT. school system, Ruth went to work for Driscoll Elementary School. She became a mentor and big sister to many of the newly minted teachers undertaking their first posting, while carrying out administrative duties. Other career paths led to support roles in the worlds of commercial real estate, packaging and marketing, law and most recently, for the last fourteen years, insurance, with Fairfield County Bank Insurance Services. The view from her desk fronting Main St. held it all. From the townsfolk clientele that were passionate about book swapping to the mail carrier bearing homemade wontons to the incredible staff who gave her everything from homemade chicken soup to surrogate grandchildren. Their collective thoughtfulness was an amazing gift to us. She took comfort in the simple, day-to-day rhythm that life in a small town can offer. Her pleasures were modest. Summer vacations on Cape Cod, crime mysteries, classic movies, a glass of wine, and being surrounded by loved ones. She made a savory onion soup, enjoyed playing bridge, loved to shop at Talbot’s and supported St. Stephens Episcopal church in Ridgefield as a devoted worshipper and volunteer. A family trip last summer to Chicago and Milwaukee included taking in an afternoon game at Wrigley Field. We will miss her hand seeking ours. She made us smile and believe in the goodness of this life, no matter the circumstances. May she rest in peace. She is survived by her three children, a son-in-law, L. Timothy Klvana; a daughter-in-law, Gayle (Augustadt); five grandchildren, David Foster Klvana, Andrew Blackburn Klvana, Aaron Foster Lyons, Benjamin Harper Lyons and Emma Starling Lyons; nieces Mary Meggison and her husband Jim, Fort Wayne, In., Kate Wardrop, Somerville, Ma. ; nephews, David R. Wardrop and his wife Maggie, Marstons Mills, Ma., Robert (Bob) Wardrop, Jr. and his wife Nancie, E. Granby, CT., grand niece, Lindsey Blair Wardrop, Somerville, Ma. ; and grand nephews Robert, John and Randy Wardrop, E. Granby, CT. She was predeceased by her husband Raymond in 2014 and her nephew Thomas (Young Tommy) Wardrop, lll, 1966. 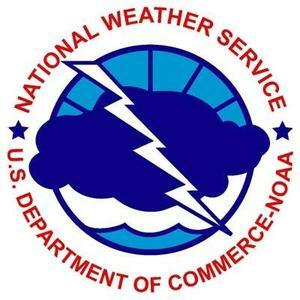 A memorial service will take place on Saturday, May 11, 2019 at 2 pm. at St. Stephen’s Episcopal Church, 351 Main St. Ridgefield, CT. The Rev. Victoria Miller, a close family friend, will offer the homily. The Rev. Whitney Altopp will preside. A reception will follow in North Hall. In lieu of flowers, please send a donation to Regional Hospice in Danbury, CT or St. Stephen’s Episcopal Church. Kane Funeral Home, 25 Catoonah Street, Ridgefield is in charge of arrangements. 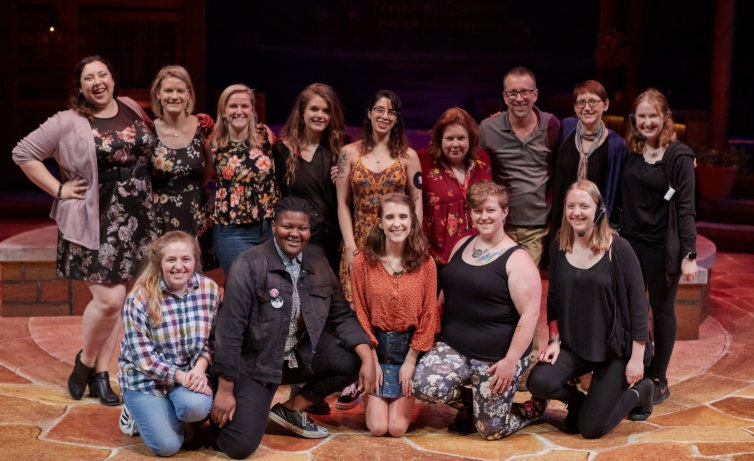 Students from the Conservatory of Theatre Arts at Webster University recently designed, constructed and performed Love's Labours Lost, a new musical based on the play by William Shakespeare with songs by Michael Friedman and book adapted by Alex Timbers. Wilton's Caitlin Witty is currently studying Musical Theatre at the Conservatory of Theatre Arts at Webster University. 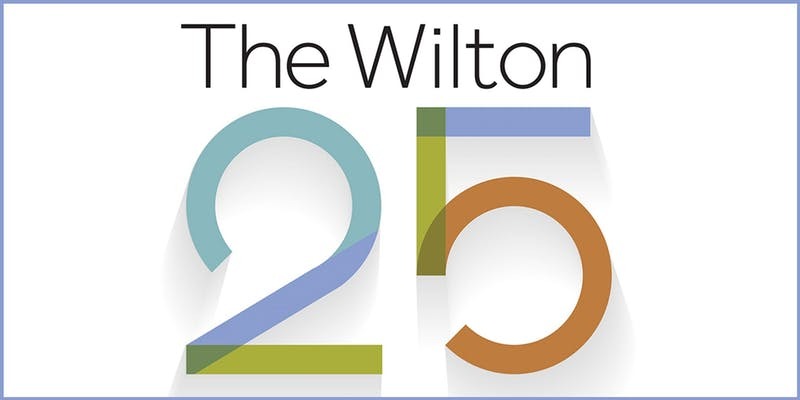 TownVibe Honors The Wilton 25 on Thursday, May 2 at Wilton Library at 6:00 pm. For additional information and to purchase tickets ($35) click here. Join us for an afternoon of great food and engaging discussion about the many health beneﬁts of eating locally sourced, sustainable foods that also nourish the soul. Enjoy samples from recipes in Cristina's new cookbook, Nourished. From Field to Fork., inspired by visits to Pete Campbell’s Horseshoe Farm. Using Pete’s fresh produce, the book showcases recipes that align with the low-allergen, low-inflammation eating style Cristina recommends to her clients. Learn more about her approach to eating and wellness developed from her experience as a certified nutritional coach, an AFAA certified personal trainer, and spinning and TRX training instructor. 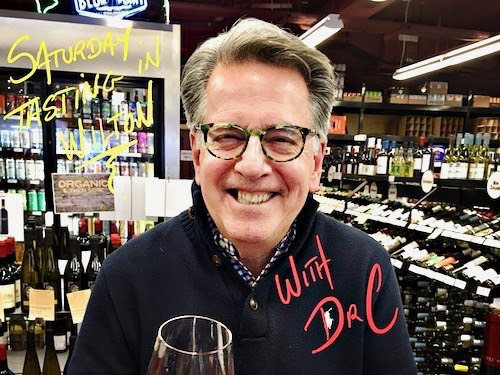 Guests will also sip Pete’s famous margarita while hearing about his commitment to growing sustainable food and re-connecting with nature before heading home with a special gift. Tickets: $75; includes food and drink. Cookbook available for purchase at the event: $35. Proceeds benefit community programs at Woodcock Nature Center. 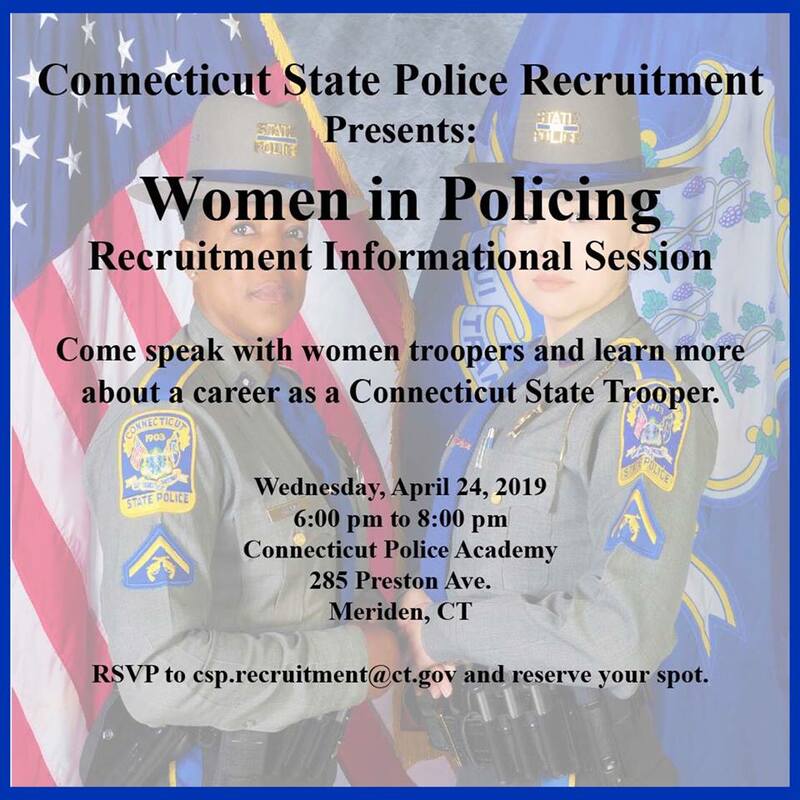 The Connecticut State Police Recruitment and Selection Unit will be holding a “Women in Policing” recruitment informational on Wednesday, April 24, 2019 between 6:00 p.m. and 8:00 p.m. at the Connecticut Police Academy, 285 Preston Ave, Meriden, CT.
You’ll have the opportunity to speak to women troopers assigned to various areas of the Connecticut State Police. Women troopers assigned to patrol and specialized units such as Major Crime, Firearms Training Unit, K9 Unit and many more will discuss their background, current assignment, challenges and experiences. Learn more about this event on Facebook here. 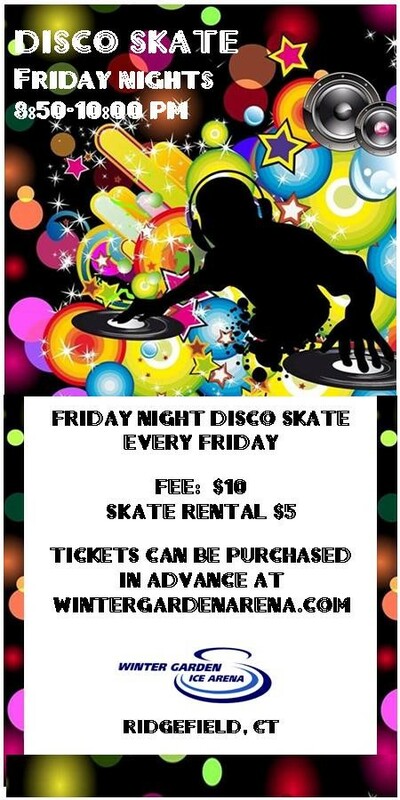 Friday night fever every Friday at Winter Garden Ice Arena from 8:50 to 10:00 pm with Disco Skate! *Please note: there are only 2 more Disco Skate events during Winter Garden's 2018-2019 season! Don't miss out on the fun! Winter Garden Ice Arena is located at 111 Prospect Ridge Road in Ridgefield. Wilton Police Detectives traveled to Bedford Hills Correctional Center in NY and took custody of Paula Hurtado (38) of Astoria, NY on an active arrest warrant. Hurtado was extradited to CT to face felony Larceny in the First Degree charges. This arrest is 3 of 4 stemming from a 2017 investigation where the suspects conducted a distraction type larceny at a local jewelry store. Hurtado posted a $100,000 surety bond and is due back in court on 04/26/2019. The fourth and final suspect in this case is currently incarcerated and will be extradited from NY when they complete the sentence in NY State. Wilton Police are investigating fraudulent charges to a credit card in December of 2018. 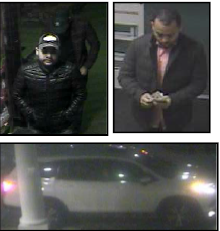 These images were captured of the suspects by Stop & Shop loss prevention. Anyone with information is asked to contact Det. Scott Sear at 203-834-6260. Visit Wilton Police on Facebook here for additional information. With books overflowing every conceivable table, cart, and shelf, Wilton Library’s Annual Gigantic Book Sale is taking shape and ready to open on Saturday, April 27 continuing through Tuesday, April 30. Early Buyers can gain entrance from 7 to 9 a.m. for a $15 admission fee. 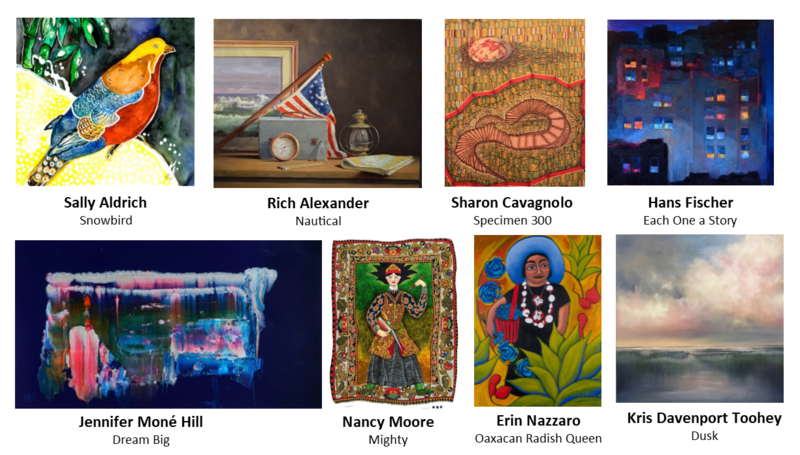 The sale is then open to everyone with no admission fee on Saturday, from 9 a.m. to 5 p.m., Sunday, from 1 to 5 p.m., Monday, from 10 a.m. to 5 p.m. with items half price and Tuesday, from 10 a.m. to 5 p.m. with pricing at $5 per bag (supplied by the library). On Saturday, the Wilton Rotary Club will once again sell hot dogs and beverages to famished shoppers. All proceeds benefit the library. More than 80,000 items are on sale in more than 50+ categories, ranging from picture books for babies to chapter books and series for teens, from mysteries to histories, from biographies to historical fiction. The sale takes up the full extent of the library’s Book Cellar and overflows into the Brubeck Room for the children’s and teen selections as well as the gallery for the Collectors Corner of rare and collectible books. The Collectors Corner is open throughout all four days of the sale –savvy shoppers can purchase their finds on the spot without having to wait for any kind of auction results. “This book sale is always so much fun when you see people swooping in to find their next great read at bargain prices,” said Susie Gross, another chair. Wilton Library is located at 137 Old Ridgefield Road in the heart of Wilton Center. For information and directions, visit www.wiltonlibrary.org or call 203-762-6334. 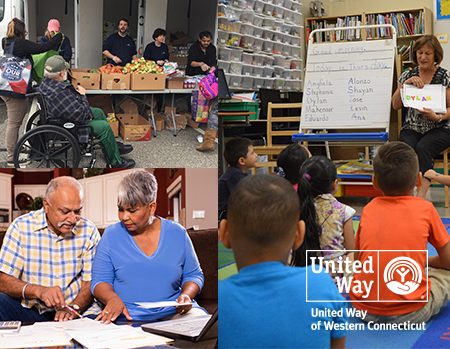 Since 2015, United Way of Western Connecticut has focused on addressing the challenges of a population we call ALICE® (Asset Limited, Income Constrained, Employed). ALICE represents Connecticut households that have earnings above the Federal Poverty Level but below a basic cost-of-living. ALICE is any working household that makes too much to be eligible for many of the government safety net programs, but still struggles to pay for basic necessities, including housing, food, childcare, healthcare, and transportation. ALICE is employed—in fact many are working more than one job. We all know ALICE personally. They care for our children in childcare centers and schools, they work in health care with our aging parents, they provide us services in retail stores and restaurants, they are the checker at our local grocery store and the security guard at our office building. Or they can be retired and living on a fixed income. The one thing they have in common is that they are one emergency away from a financial crisis. 2. How many people are ALICE in this region? About 40,000 Western Connecticut households—one in three—are ALICE and typically live paycheck to paycheck. Combined with people living in poverty, 40% of the population in our region is making less than the ALICE Household Survival Budget. Every town and city in CT is home to the ALICE population. Want to know how many of your neighbors are ALICE? Click here. 3. How can I tell if I am ALICE? The Household Survival Budget determines whether you and your family are part of the ALICE population. In Fairfield County, if you have a toddler and an infant, you can be making as much as $81,792 and be an ALICE household. To determine if you are an ALICE based on your household size, click here. 4. What is United Way doing to help ALICE? Providing free, fresh food at Mobile Food Pantries so ALICE can spend less money at the grocery store and redirect funds to other basic needs. Providing childcare and after-school subsidies so ALICE families can know their children are in safe, high-quality programs while they work. We also have a fund that pays for out-of-school activities (sports, dance, music lessons). Offering free budget coaching, the SaverLife™ savings program, and free tax preparation services so ALICE can start to save and plan for the future. 5. How can I help ALICE? Go to www.uwwesternct.org to learn more about what we do and how you can get involved, or to make a donation. If someone you know needs immediate assistance, dial 2-1-1.